The Heinkel He 111 was a German aircraft designed by Siegfried and Walter Günter at Heinkel Flugzeugwerke in 1934. Through development it was described as a "wolf in sheep's clothing". Due to restrictions placed on Germany after the First World War prohibiting bombers, it masqueraded as a civil airliner, although from conception the design was intended to provide the nascent Luftwaffe with a fast medium bomber. Perhaps the best-recognized German bomber due to the distinctive, extensively glazed "greenhouse" nose of later versions, the Heinkel He 111 was the most numerous Luftwaffe bomber during the early stages of World War II. The bomber fared well until the Battle of Britain, when its weak defensive armament was exposed. Nevertheless, it proved capable of sustaining heavy damage and remaining airborne. As the war progressed, the He 111 was used in a variety of roles on every front in the European theater. It was used as a strategic bomber during the Battle of Britain, a torpedo bomber in the Atlantic and Arctic, and a medium bomber and a transport aircraft on the Western, Eastern, Mediterranean, Middle Eastern, and North African Front theaters. The He 111 was constantly upgraded and modified, but became obsolete during the latter part of the war. The German Bomber B project was not realized, which forced the Luftwaffe to continue operating the He 111 in combat roles until the end of the war. Manufacture of the He 111 ceased in September 1944, at which point piston-engine bomber production was largely halted in favor of fighter aircraft. With the German bomber force virtually defunct, the He 111 was used for logistics. Production of the Heinkel continued after the war as the Spanish-built CASA 2.111. Spain received a batch of He 111H-16s in 1943 along with an agreement to licence-build Spanish versions. Its air frame was produced in Spain under licence by Construcciones Aeronáuticas SA. The design differed significantly in power plant only, eventually being equipped with Rolls-Royce Merlin engines. The Heinkel's descendant continued in service until 1973. Mushroom Model Publications is based in the UK. All their books are printed by their associate Stratus in Sandomierz, Poland, in English. Stratus also does their own line of books in both English and Polish. This is really a folder with scale plans, all to 1/32nd scale in it. The cover art shows a color photo of a He-111 flying above the clouds on a brown background that has a yellow line drawing of the front and top of a bomber that I cannot identify. The back cover is brown with a yellow line drawing of the landing gear and top of a Stuka. The folder contains 3 long sheets that are 30" long. They are folded along that length to create 8 pages each in 8 1/4" x 11" page format. The face side of the first fold out sheet has a side view of a He-111H-3, illustrations of its fuselage inner brace works and the cowling of it's Jumo 211A-1 engine. The reverse side has a top view of the He-111H-6. The face side of the second fold out sheet has another top view of the He-111H-6 with different dorsal gun and elimination of the side guns and one nose gun. The reverse side has 2 side views of this version. The face side of the third fold out sheet has 2 side views of a He-111H-10. The reverse side has a side view of a He-111H-15 with 3 HV-246 "Hagelkorn" flying bombs mounted and a side view of a He-111H-16. All the illustrations are to 1/32nd scale. 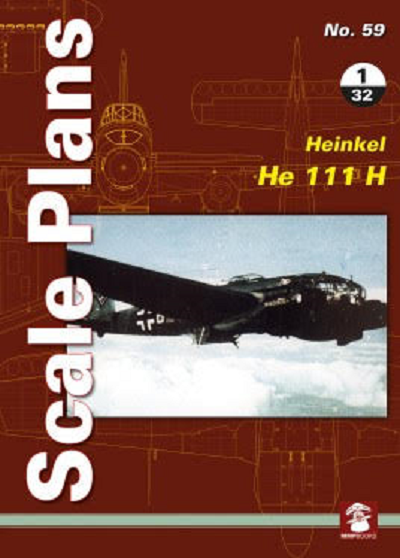 Revell makes a 1/32nd scale kit of the He-111P and a H version.